The Osage Indians originally lived along the Missouri rivers. The tribe was semi nomadic and their movements were seasonal based on hunting, and foraging, which often lead them to other areas. The men shaved their heads, leaving only a scalplock extending from the forehead to the back of the neck. The pattern of a man’s scalplock indicated his clan. Men wore deerskin loincloths, leggings, moccasins, and bearskin or buffalo robes when it was cold. The women kept their hair long and wore deerskin dresses, leggings, and moccasins. The animals hunted were deer, elk, and bison. The women dried the meat, and prepared the hides. The women also gathered wild plant and kept gardens of corn, beans, squash, and pumpkins. Evidence indicate there were probably three routes of Osage immigration into the trans-Mississippi West. Small groups followed the White River to Arkansas, Missouri, and eastern Oklahoma. The Osage were first contacted by the French explorers Jacques Marquette and Louis Joliet in 1673. In 1724, the Osage allied with the French against the Spanish in their fight for control of the Mississippi region. By 1750 the Osage had established control over half or more of Missouri, Arkansas, Oklahoma, and Kansas. One of the largest Osage bands in Oklahoma before 1800 was the Black Dog band. The Black Dog Trail from Baxter Springs, Kansas, to beyond the 100th Meridian was the first improved road in both Oklahoma and Kansas. In 1803 Black Dog moved to Ho-tsa-Tun-ka (Big Cedar) now Claremore, Oklahoma. Ka-se-gra (Tracks Far Away) who was usually called Big Track, had already established the core Oklahoma bands at Three Forks some years earlier. Claremore or Town Maker moved this group to near present Claremore at Claremore Mound. This village was called the Place of the Oaks. 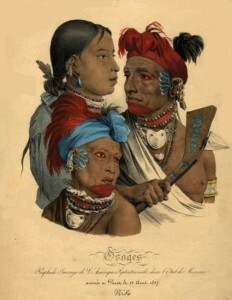 A third large band of Osages in Oklahoma before 1800 were the Grosse Cotes or Big Hills near Nowata. Possibly over a thousand or more other Osages resided in Oklahoma before 1800 in small villages. Osage village and campsites were favored places for later settlements because the sites were cleared, and they were in the network of Osage trails that became the highways of today. In 1804 Lewis and Clark encounterd the Osage and at that time the tribe numbered approximately 5,000. The “Osage Treaty” was the first made in 1808 between the Osage tribal members and the United States. The treaty involved the cession of 52,480,000 acres in Missouri. The Osage ceded their traditional lands across Missouri, Arkansas, and Oklahoma to the US in additional treaties during 1818 and 1825. In exchange they were to receive reservation lands and supplies to help them adapt to farming and a more settled culture. The U.S. government forced all Osage bands to remove from Arkansas and Oklahoma in 1839. These bands were relocated on the Verdigris River in the Kansas part of Indian Territory, where the Missouri Osage had agreed to settle in 1825. Thus, removal back to Oklahoma from Kansas in 1871 was the third displacement within forty-six years. The previous removals were bad, but the 1871 expulsion was worse in terms of lives lost and hardships. This move almost destroyed the Osage people. Old tombstones indicate the greatest toll was among young mothers and infants. The Osage traded meat, hides, and oil, to other Indians and to Europeans. Grazing became economically important in the 1890s. Income mainly from grazing leases caused the commissioner of Indian affairs to call the Osages the richest people on earth. Petroleum income did not become a monetary factor until after Osage allotment in 1906-1907. By the 1920s the commissioner’s comment had come closer to the truth. Osage grass-leasing regulations made an easy transfer from grass to oil leasing. “Black Gold” became a national term when an Osage-bred,-trained, and-owned a race horse by that name won the Kentucky Derby in 1924. Income from grass and mineral leases were distributed quarterly on a per capita basis to those who had been living in 1907. In addition, each headright holder, (one entitled to an equal share of the tribe’s mineral interests) was allotted just over 640 acres in Osage County, Oklahoma. 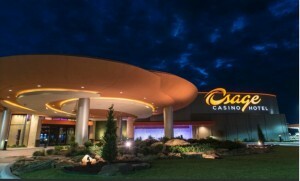 Osage prosperity attracted money-hungry outsiders. 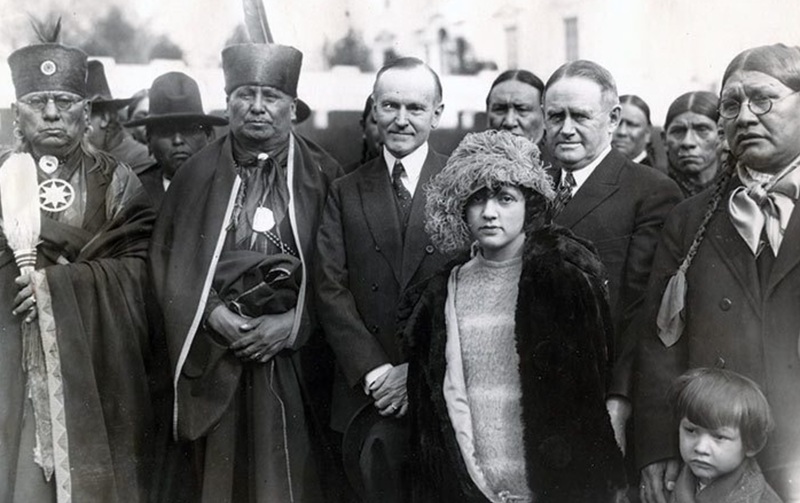 The so-called Reign of Terror, in which a number of Osage were murdered for their petroleum wealth, ended only when the newly formed Federal Bureau of Investigation (FBI) won a conviction in federal courts. Since then, stereotypes and exaggerated stories about rich Indians and books about the murders have held the center stage in Osage-related literature. 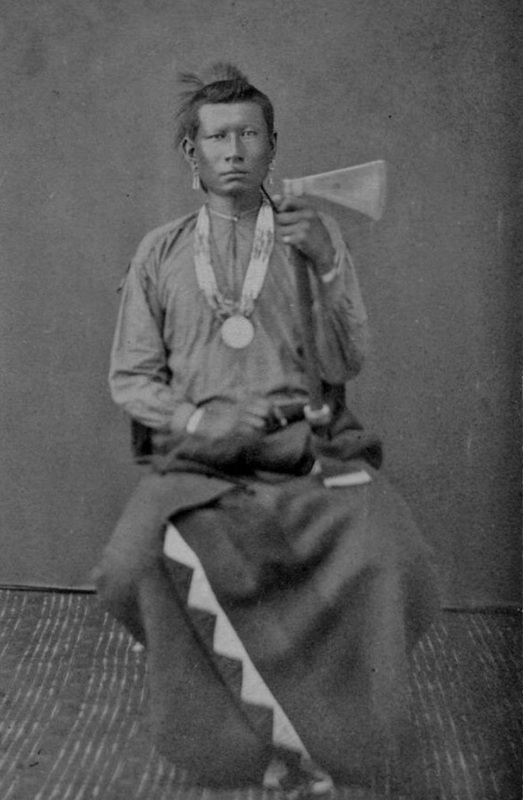 As a result, little has been said about the majority of the Osage people, who were busy giving their children the best education money could buy, who worked hard to produce beef for American tables, who firmly backed their state and nation in both war and peace. Although they were not U.S. citizens during World War I, Osage men accepted the draft and volunteered for service in the highest percentage of any ethnic group of U.S. citizens. Where did the Osage live originally? Who were the first explorers to contact the Osage people? 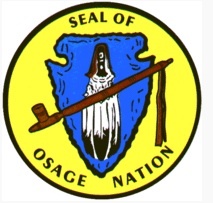 What was the name of one of the larger bands of Osage? What did the pattern of a man’s scalplock mean? 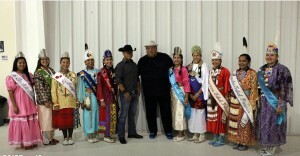 Name some of the responsibilities of the Osage women. Today there are approximately fifteen thousand Osage people. 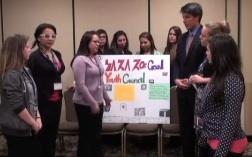 Today the Osage Nation has their own government and executive system. In addition, The Osage Nation has started a fitness program to encourage employees to lead healthy life styles.The program also includes children. 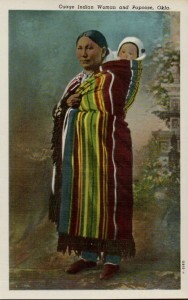 Notable Osages include John Joseph Mathews, Gen. Clarence Tinker, Maria and Marjorie Tallchief, and Bacon Rind. “Way beyond the earth, a part of the Osage lived in the sky. They wanted to know where they came from, so they went to the sun. He told them that they were his children. Then they wandered still farther and came to the moon. She told them that she gave birth to them, and that the sun was their father. She said that they must leave the sky and go down to live on earth. They obeyed, but found the earth covered with water. They could not return to their home in the sky, so they wept and called out, but no answer came from anywhere. They floated about in the air, seeking in every direction for help from some god; but they found none. The animals were with them, and of these the elk inspired all creatures with confidence because he was the finest and the most stately. 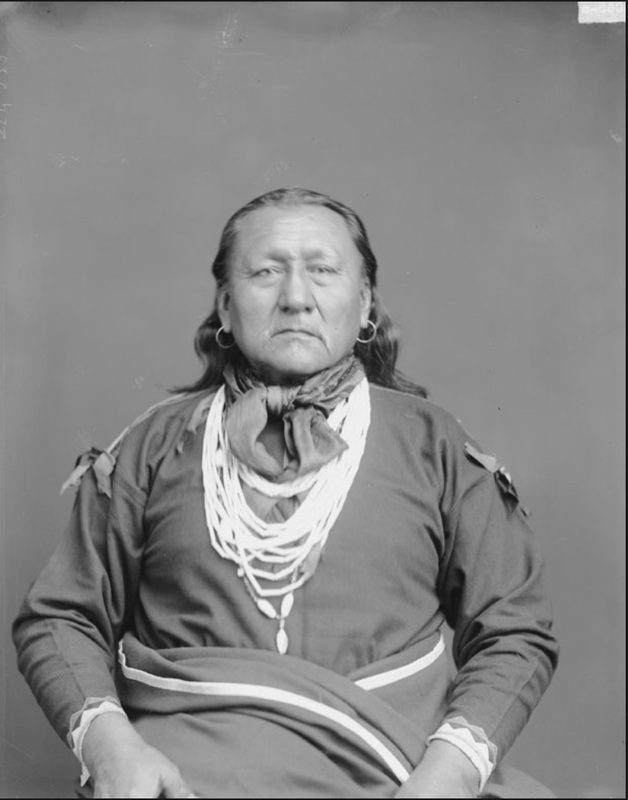 The Osage appealed to the elk for help, and he dropped into the water and began to sink. Then he called to the winds, and they came from all quarters and blew until the waters went upward in a mist.